‍Achieve higher email opt-in rates with our unique exit popup! 1. 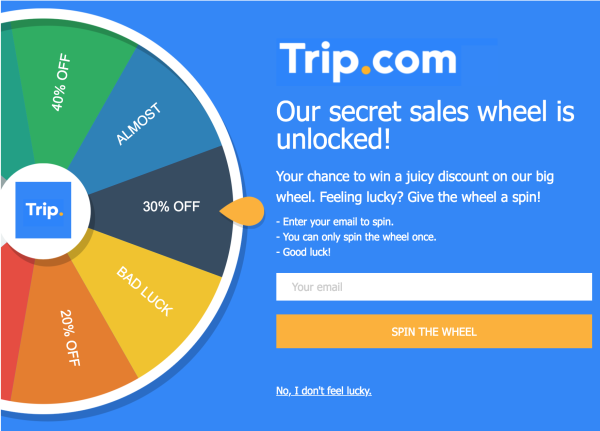 Just when visitors are about to leave your website, a special prize wheel pops up. 2. 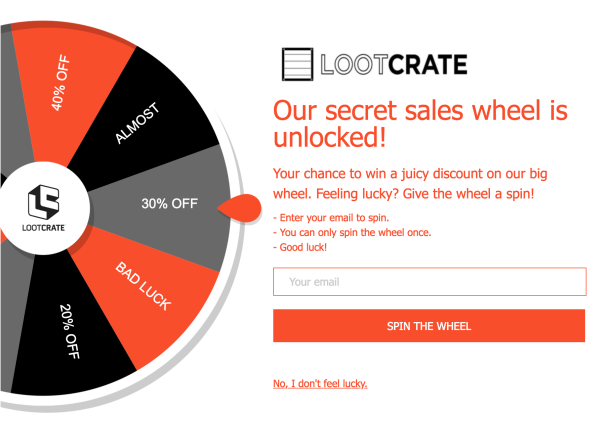 They enter their email address, spin the prize wheel and win a random discount. Unique exit intent pop up that's interactive, customizable and fun for visitors. Grow your email signup conversion rates 3x and boost sales 35%. Control all the text and colors so you can design it to match your website. Add your company's logo for additional branding. Specify the exact prizes your visitors can win and the probability of how frequently each prize is awarded. Get advanced insights into exactly how many times Wheely Sales is displaying on your website and how many emails it's grabbing. Get their names, email addresses, phone numbers, or anything else you want to ask from your visitors to enter before spinning the wheel and then export these anytime. Wheely Sales is responsive to any screen size so that your wheel always looks good no matter what. And our exit intent technology is specifically adapted for mobile touch screens. Or connect to any email automation tool with our Zapier integration! "This app converts ~12% of our website visitors into mailing list subscribers whereas, with a traditional email sign-up pop-up, we were only converting ~4%." "Driving force in our email growth"
"Wheely Sales consistently outperforms other lead capturing tools. It's fun for web visitors, looks great with our branding/colors and is something our competition isn't using yet." Unlimited websites & wheels on all plans. You get a 10 day FREE trial with every plan when you sign up. We're confident you will see boosted email capture and sales results in this time! Here are some questions new users often ask when first getting their popup wheels setup. But if you have any other questions, don't hesitate to contact us! Will it definitely work on my website? And how do I install it? Definitely. We have built the app to work well on any platform or website. All you have to do is copy and paste one line of code! See our instruction guides here. Which wheel parts can I customize for my website? 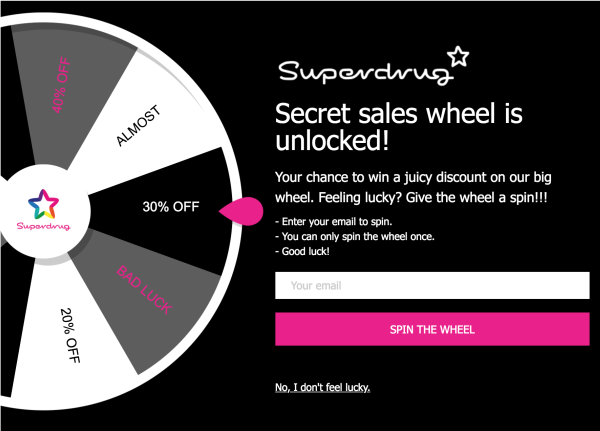 The whole wheel popup is fully customizable so you can make it say, do and look exactly how you want! This includes the colors, logos, text and fields. Does Wheely Sales work on mobile? Of course! The popup is fully responsive, so it adjusts and looks great on both mobile and desktop devices. When does the popup wheel show? Wheely Sales is designed to popup on exit intent. This means as soon as your visitor is about to leave your website. On desktop this is specifically when the mouse moves up and out of the browser window and for mobile this is when a user suddenly scrolls up. Will a visitor see the wheel popup every time they visit my website? No. They will see it the first time they visit, and then we won't load the wheel for that visitor for a specific number of days which you control. This way, you're in charge and visitors can't take advantage of the system. Will it affect my website speed and SEO? No - keeping your website speedy and ranking on google is a big priority. So Wheely Sales is designed to only load only after your website is fully loaded and not affect speed or SEO. Is Wheely Sales GDPR compliant? Yes. Wheely Sales allows you to add a GDPR-compliant checkbox that visitors are required to accept to receive marketing emails. Can I translate the wheel into any language? Absolutely! All of text in the Wheely Sales popup is fully customizable. This means you can translate it into any language. © Wheely Sales, 2018. All rights reserved.